Let’s face it: a lot of us are more than happy to say goodbye to 2018 and turn over a new leaf. 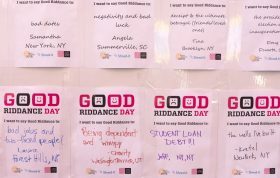 If you’re ready for some cathartic collective destruction, use your lunch break on Friday to join others in Times Square for the 12th annual “Good Riddance Day” and say goodbye to the worst of this year. 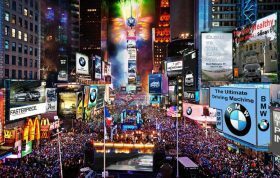 The event, hosted by the Times Square Alliance, is inspired by a tradition in some parts of Latin America in which New Year’s revelers stuff dolls with objects representing bad memories and burn them in order to make room for the new. 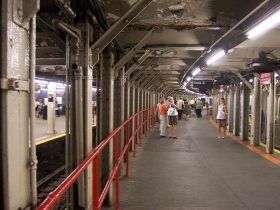 New York City has 280 miles of scaffolding, totaling more than 7,700 sidewalk sheds in front of 7,752 buildings. Described as pervasive eyesores and sunlight-blockers, scaffolding has an unflattering reputation in the city. 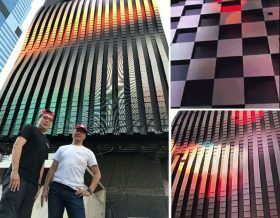 Artist Sam Biroscak is looking to change the public perception of these sidewalk sheds, by highlighting it as an “under-appreciated” urban element in his conceptual design. 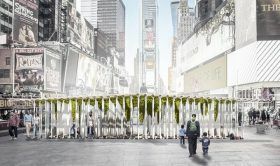 Dubbed Mossgrove, Biroscak’s project would create an architectural pavilion in Times Square made of two materials seen as nuisances: moss and scaffolding. 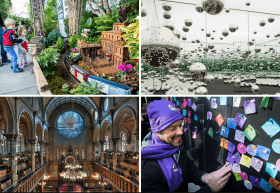 The proposal calls for the installation be built during NYCxDESIGN, a nine-day event featuring interactive installations and talks. 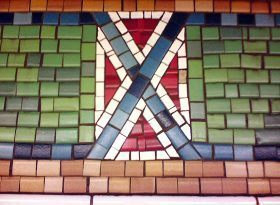 The theme of this year’s Design Pavilion will be “From This Day Forward” (h/t Untapped Cities). 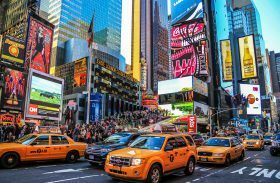 New York City’s avenue blocks are long, as are its winters; getting from Rockefeller Center to Times Square can be an unpleasant, cold and crowded experience–unless you take the underground passageway, the city’s largest, that spans the entire two-block-plus distance. 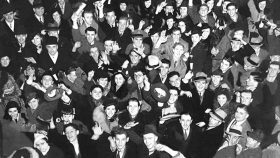 Below, take a virtual stroll from avenue to avenue (and from the B/D/F/M to the N/R/W subways): Enter on the west side of Fifth Avenue between 50th and 51st Street and exit at Seventh Avenue and 49th Street–and buy yourself a few more minutes before you burrow into that parka.